Cheer Fee: $150.00 until May 31st and $175.00 beginning on June 1st. Footbal Fee: $225.00 until May 31st and $250.00 beginning on June 1st. Q: What does my fee include? A: Your football fee includes use of all required equipment (other than cleats, mouth guard, and cup). In addition, it pays for the field time, referees, and all associated expenses. A: The first day of practice is set for Monday, August 13th. A: Many of the skills, regardless of level or age, used during the year are learned in August, and your child could potentially fall behind the team developmental level. Additionally, the first week is a required 10 hours of pre-pad conditioning necessary prior to advancing to pads (for football), or stunting (for Cheer). Missing all or part of that week can be significant. Our organization asks that parents use their best judgement around missing practice in lieu of vacation time and make the decision around what serves your family the best. Once school begins, practices typically switch to be Tuesday/Thursday 5:30 p.m. to 7:30 / 8:00 pm and possibly a walk through the day before Game Day. Cheer will typically be Monday/Wednesday/Friday 3:30pm – 5:30pm. A: There will be a jamboree the last weekend in August. The exact times for the two Youth Teams and the Junior Team is yet to be determined. We will post on this site as soon as we know the exact times. The regular season game schedule will be posted on this site as soon as we have it finalized. Q: I hear that I will have to volunteer time during the season. How much time? 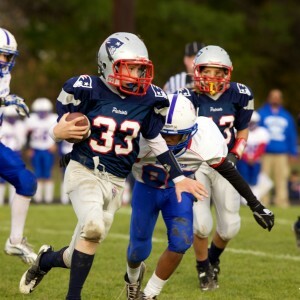 A: The Amherst Patriots rely heavily on volunteers to do many jobs. These range from Coach to Board Member to working in the snack shack. How many hours you will need to do will depend on the job you have chosen, and how many slots need to be filled. For example, the snack shack needs to be staffed from an hour before the first game until an hour after the last game. The team moms along with the volunteer coordinator will work with you to determine what jobs you can do and when you will need to do them. Remember that we cannot be successful without our volunteers! Please check out the volunteer page for more information. Q: What is the Amherst Patriots’ refund policy? A: The refund you could receive will vary greatly depending upon when you withdraw from the program. Please see our refund policy page for detailed information. A: Typically eight games plus the playoffs. A: In August our practices will be held at Wilkins Elementary in Amherst. When school starts both football players and Cheerleaders will transition to another location. 2016 season we practiced at Simeon Wilson field at Souhegan High School. Games are held at Souhegan High School. Q: Do I have to be at every practice or game? A: We certainly invite all parents to stay for each practice if they desire to do so. However it is not necessary. However, if you do NOT stay at practice please be aware of the weather (we cannot practice in thunderstorms), and please have your cell phone available in case something happens. While you do not have to stay at the games either, the community atmosphere is something to be enjoyed and we highly encourage it. Additionally please be aware of your volunteer responsibilities.